St Marc’s, lively, informal and friendly ! See our “What’s on” page for upcoming events in Church ! The English speaking church of Grenoble is a vibrant and exciting Bible focused church with members from all over the world. We are part of the Anglican diocese of Europe and affiliated to ICS. 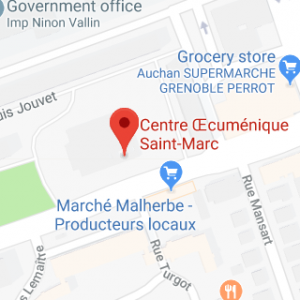 We meet every Sunday in St Marc’s Ecumenical Centre (see map here) at 10H45 in the room called “Cana” & offer 2 Sunday school groups for children from 3-11. Currently we are in an interim period. Our last Pastor, Bob, has returned to the UK to take up an new mission there. We have just said goodbye to Michael Selman, our second “locum”. We have been blessed to have him and his wife, Jo, with us ! Our third locum, Clifford Owen will be with us for 3 weeks in March ! Some people join us for a couple of years and others just for a couple of weeks, some live in France permanently, but however long you are with us, you will soon find that you feel part of our growing church family. We think of St. Marc’s as an oasis in the city, put here by God, for you. Is anyone thirsty? Jesus said “Let them come to me and drink”. Wherever you’re from, whatever your background, a warm welcome awaits you!